Plan3D let's you visualize almost any house interior and landscaping projects. Trace any floor plan you've scanned - do lot slope, create your dreamhome and do it all in 3D perspective, elevation or overhead views. It's easy enough for homeowners and powerful enough for contractors and builders to sketch out realistic blueprints and overhead views with shadows, reflections and lights they can show their clients. Landscape design can be viewed in 2D or 3D. Hide roofs to expose interiors - put in landscaping interior design designer decorator yard garden garage carport patio online software driveway sidewalk garden and home. "Let me start by saying that I am new to plan 3D and I am completely hooked! We are having a home built... re-creating the floor plan with plan3D has been incredibly helpful. The kids tease me and say now Mom has her own video game!" "I subscribed to your 3D Plan website and absolutely love it so much I have sent your web page to friends and family members." "...as a student in Interior Design I can't believe the quality - it's really amazing. I am so pleased with the work I have been able to do and it's so simple!" "[plan3D] is exactly what I had been searching for to design and customize the home we're planning." Plan3D - Online Home Design Tool - Home Design, Interior Design and Landscaping. The Right Design Tool Saves You Time & Money! Use plan3D to Trace Floor Plans & Convert Blueprints! Many professional designers use plan3D's Home Design Software -- but you don't need any special training to put this great tool to use for yourself! 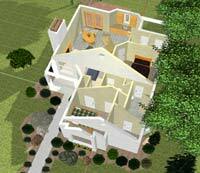 Design homes in 3D, blueprint, overhead and elevation views. Switch between views instantly. Work in different views at the same time. Whatever you do in one view affects the others. Whatever your house plan, you can make it better with plan3D. Trace Floors Plans Quickly & Convert Any Blueprint into Lifelike 3D! 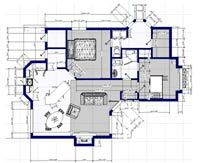 Plan3D takes the hard work out of converting your floor plans, blueprints and drawings into 3D. Import scanned 2D plans and quickly convert them to three dimensional homes or buildings. Plan3D automatically scales drawings so anything you draw in 3D (like walls, floors and roofs) exactly matches the dimensions of your plans. Put windows, doors, cabinets, furniture and bathroom fixtures at exactly the correct position while working in 3D. Click to learn more about plan3D. Plus, get 2 months FREE when you sign up for one year! Click either image to get a larger view and a brief demo.